Two months prior, a volcano named Mount Tambora erupted on the Indonesian island of Sumbawa, killing 100,000 people and plunging the Earth into a 'year without a summer' in 1816. Now, Dr. Matthew Genge from Imperial College London has discovered that electrified volcanic ash from eruptions can 'short-circuit' the electrical current of the ionosphere—the upper level of the atmosphere that is responsible for cloud formation. 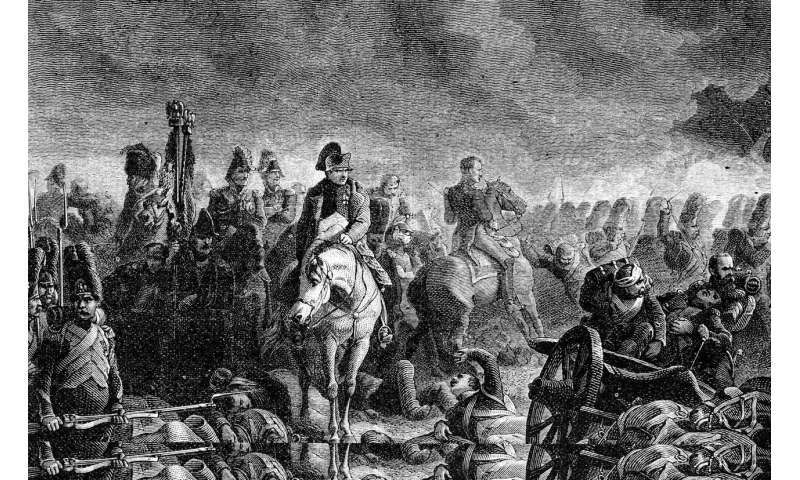 The findings, published today in Geology, could confirm the suggested link between the eruption and Napoleon's defeat. Dr. Genge, from Imperial's Department of Earth Science and Engineering, suggests that the Tambora eruption short-circuited the ionosphere, ultimately leading to a pulse of cloud formation. This brought heavy rain across Europe that contributed to Napoleon Bonaparte's defeat. The paper shows that eruptions can hurl ash much higher than previously thought into the atmosphere—up to 100 kilometres above ground. Dr. Genge said: "Previously, geologists thought that volcanic ash gets trapped in the lower atmosphere, because volcanic plumes rise buoyantly. My research, however, shows that ash can be shot into the upper atmosphere by electrical forces." A series of experiments showed that that electrostatic forces could lift ash far higher than by buoyancy alone. Dr. Genge created a model to calculate how far charged volcanic ash could levitate, and found that particles smaller than 0.2 millionths of a metre in diameter could reach the ionosphere during large eruptions. He said: "Volcanic plumes and ash both can have negative electrical charges and thus the plume repels the ash, propelling it high in the atmosphere. The effect works very much like the way two magnets are pushed away from each other if their poles match." Weather records are sparse for 1815, so to test his theory, Dr. Genge examined weather records following the 1883 eruption of another Indonesian volcano, Krakatau. In addition, a special cloud type appeared more frequently than usual following the Krakatau eruption. Noctilucent clouds are rare and luminous, and form in the ionosphere. Dr. Genge suggests these clouds therefore provide evidence for the electrostatic levitation of ash from large volcanic eruptions. Dr. Genge said: "Vigo Hugo in the novel Les Miserables said of the Battle of Waterloo: 'an unseasonably clouded sky sufficed to bring about the collapse of a World.' Now we are a step closer to understanding Tambora's part in the Battle from half a world away." I have learned this through my own folly, volcanoes are always in play! That's a crappy analogy. With electrostatics there is no need for pole-matching. How about "The effect works very much like the way hairs on one's head repel each other if rubbed with a balloon." There was a good deal more than clouds and rain involved in Boney's defeat. For cripe's sake, get a grip. There may be some solid science at the bottom of this article, but the extravagant deductions about military defeat based on weather patterns caused by volcanoes are just woolly thinking by another journo trying to get clicks.